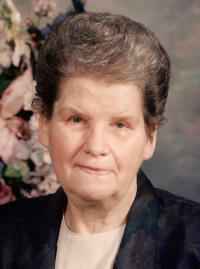 Valeria R. “Leri” Kuhl, nee Endres, 79, of Germantown, died Tuesday, April 10, 2007 at Caring First Nursing Home in Breese. Mrs. Kuhl was born May 23, 1927 in Belleville to Anton and Marie (Haar) Endres; they preceded her in death. She married Robert B. Kuhl on August 27, 1946 at St. Francis Catholic Church in Aviston; he preceded her in death on October 14, 1983. Also preceded in death by a daughter, Elaine Schroeder; a daughter-in-law Joyce Kuhl; a son-in-law, Mike Gebke; sisters, Margaret Huelsmann, Florence Sarten, Rose Endres; a brother-in-law Ralph Fonke. Surviving are her children Robert A. Kuhl of Swansea, Richard (Rosemary) Kuhl of Atlanta, GA, Patricia (Jack) Schlautman of Wentzville, MO, Kenneth (Donna) Kuhl of Germantown, Dennis “Boomer” Kuhl of Germantown, Donna Lampe of Imperial, MO, Diane “Fuzzy” (friend Tom Winkeler) Gebke of Germantown, Mark (Amy) Kuhl of Breese. A son-in-law, Ron Schroeder of Germantown. 30 Grandchildren and 35 Great-Grandchildren. Brothers, Virgil (Genny) Endres of Forsyth, MO, Norman (Rosie) Endres of Germantown, Tony (Mary) Endres of Breese, Jerry (Ruth) Endres of Breese. A sister, Dolores Fonke of Breese. Brothers-in-law, Herbert “Hugo” Huelsmann of Fort Walton Beach, FL and George Sarten of Lenoir City, TN. Leri along with her husband Robert were the owners and operators of Valbo’s Lounge in Germantown for 30 years. She was a member of St. Boniface Catholic Church and Altar Sodality in Germantown. Funeral Mass of Christian Burial will be Thursday, April 12, 2007 at 11:00 AM at St. Boniface Catholic Church in Germantown with Fr. Stephen Humphrey officiating. Interment will be in St. Boniface Cemetery, Germantown. Visitation will be Wednesday, April 11, 2007 from 4:00-9:00 PM and again on Thursday, April 12, 2007 from 8:00-10:45 AM at the Moss Funeral Home in Germantown. Memorials can be made to the Breese Knights of Columbus PRO-LIFE or St. Jude’s and will be received at the funeral home.